The sprawling cardboard empire that is Topps Now keeps its print-to-order format for top MLB moments via 2019 Topps Now Baseball. While Topps has many different choices under the Now banner, Topps Now MLB is easily the biggest and most popular. 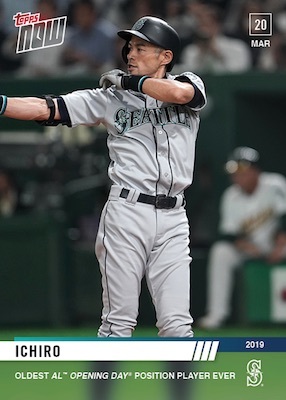 2019 Topps Now Baseball is naturally for the key events during the 2019 MLB season, but Topps tends to break things down a little more than that. Based on recent years, the main Now Baseball set for 2019 won't officially start until MLB Opening Day, but there is still plenty to keep collectors busy. Following 2018 Topps Now Baseball—topping out at nearly 1,000 cards in the main release—came 2018-19 Topps Now Offseason to handle the in-between action. View available Topps Now MLB cards on the Topps site. 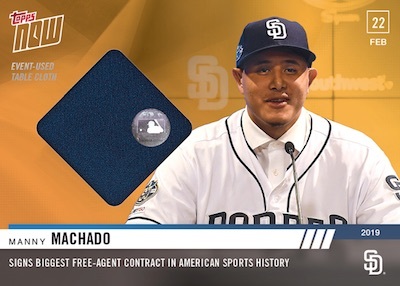 For 2019, the first choice was 2019 Topps Now Road to Opening Day, which debuted the new primary design, and then came 2019 Topps Now Spring Training, covered below. These offshoots are easy to distinguish because they generally have prefixes that correspond to the set in question. In fact, Spring Training cards kicked off the Now line with an event-used relic for Manny Machado. 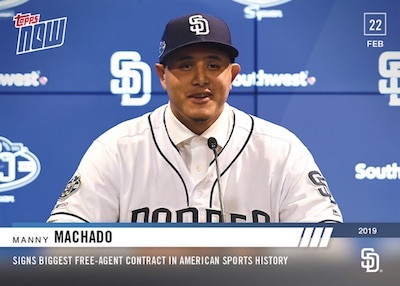 The interesting part is that the tablecloth relic apparently came from the press conference at Peoria Park to announce his signing with Padres. It is also MLB Authenticated, which is certainly unexpected given we are talking about the fabric sheet covering the table. The new 2019 Topps Now Future cards, including the initial World Series editions, award collectors bonus cards. Topps has maintained the same pricing of $9.99 per base card for the entire run and that is the case in 2019, as well. These normally carry a 24-hour selling period. Collectors can buy in bulk to decrease the per-card cost for the base cards. Topps Now MLB autographs and relics are more expensive and come with limited print runs. The 2019 Topps Now Baseball checklist will continue to grow throughout the year, so check back for regular updates. Print runs (PR) will be added when known. Buy on Topps. Buy earlier 2019 Topps Now MLB cards on eBay. 2019 Topps Now 10D - Mike Trout Angels - Contract Signing On-Card Auto # 10 Red! 2019 Topps Now 10E - Mike Trout Angels - Contract Signing On-Card Auto # 5 Red!